As a student in the early childhood education major you'll learn to work with children and families in the classroom and in the field. You will be trained to assess a child's needs, design lesson plans and tutor for success to create the best learning environments for children. Your work will prepare you to respond to the growing demand for early childhood programs with professionally trained directors and staff who nurture children and ready them for school success. 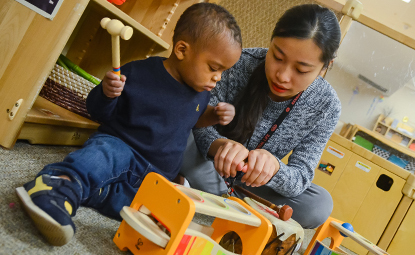 An undergraduate major in Early Childhood Education leads to a Minnesota Teaching Licensure for birth through third-grade classrooms. Students have life changing community experiences through collaboration and partnerships programs that take them inside a variety of early childhood learning programs. Study abroad and student teaching opportunities in China, Chile, Italy and South Africa expand students' multicultural experiences. Our students develop leadership skills in the student chapter of the Association for the Education of Young Children (AEYC), which advocates for children through fundraising projects and volunteering at St. Cloud State's Lindgren Child Care Center, the Salvation Army and Anna Marie's Women's Shelter. The School of Education's rich history of preparing teachers and educators enjoys a well-established reputation locally, statewide, and nationally. Select courses are available online. St. Cloud State's School of Education operates a Feeding our Future program, providing almost 30,000 meals to children in St. Cloud learning sites. Notable alumna: Valeria Silva, '90 (teacher licensing, elective studies) leads Minnesota's second-largest school district. Lindgren Child Care Center Director Debra Carlson selected 2014 National Coalition of Campus Children's Center (NCCCC) Director of the Year.